Inspired by her childhood journeys into Colombia’s rainforests with her anthropologist father, Tatiana Arocha’s multidisciplinary work stems from a desire to celebrate the landscape’s astounding biodiversity. 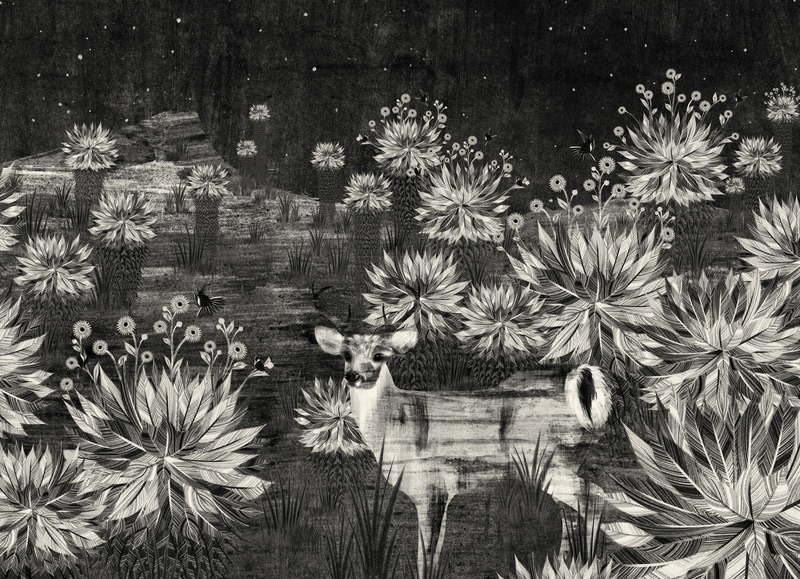 Her immersive murals surround the viewer with nature rendered in monochromatic tones, a color palette that references historic naturalist engravings and warns of a future in which the rainforest exists only in the past. By installing depictions of nature in urban settings, Arocha’s murals draw parallels between the diverse ecosystems of Colombia and the cultural flourishing of her current Brooklyn neighborhood. Combining digital and traditional painting techniques, Arocha transforms the BRIC Café walls into the magical Colombian páramos, or moorlands. To construct each element of the imaginatively dense scene, Arocha draws on a library of analog sources ranging from 18th-century botanical drawings to her own photography. After selecting a foundational shape for each leaf, branch, flower, or animal, she fills it by layering hundreds of digitally manipulated images and textures. By building each element of the composition from hundreds of layers, Arocha mimics the compounding density of nature and the hybridization of organic specimens with technological artifacts. As a result of including three-dimensional details, the mural extends into outer planes, establishing a diorama into which visitors can connect with nature as a respite from the urban experience. Arocha’s work has been shown at DeKalb Market Hall, BLDG 92, The Vazquez Building, and the SONYA Art Walk, all in Brooklyn; the Queens Botanic Garden; the Max L. Jackson Gallery, Charlotte, NC; and Casa 9.69, Bogotá. She has received awards and commissions from Goethe-Institut Kolumbien, the Arquetopia Oaxaca International Artist Residency, 3x3 Magazine, The Wassaic Project, and SundanceTV. Arocha earned her BFA in Graphic Design from the Universidad de Bogotá Jorge Tadeo Lozano, Colombia.